There are hundreds of advertising-supported applications based on the JustPlugIt-engine, and BestDiscountApp is one of them. The application looks extremely useful at first sight; however, if you install it on your system, you will soon find out that this application is useless. 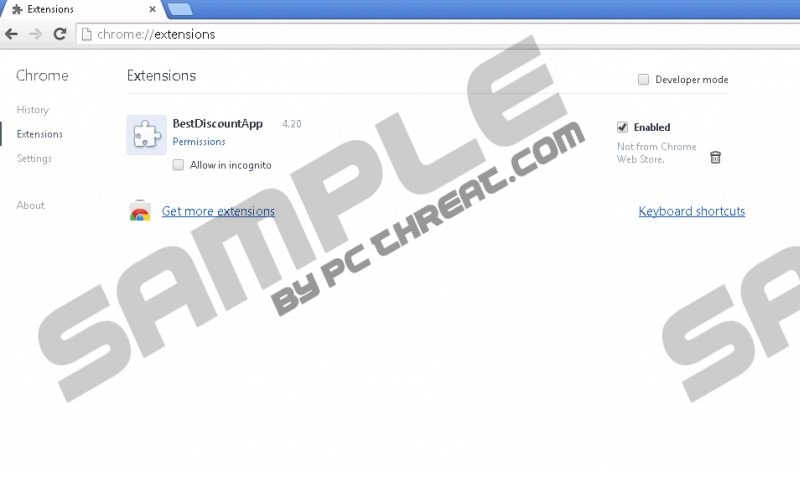 The researchers at pcthreat.com have found that BestDiscountApp is a typical advertising-supported application. The program does not differ from SaveNShop, LuckyCoupon, and RealDeal, so it is not worth keeping it on the system. If you do not pay attention to our advice and still let this adware stay, there is no doubt that you will notice different commercial advertisements on your screen. They will appear on your Internet Explorer, Google Chrome, and Mozilla Firefox browsers. You can get rid of all of them by deleting BestDiscountApp. Continue reading to find out how to do that. As has been already mentioned, BestDiscountApp will show commercial advertisements, so you should delete it as soon as possible because this program might ruin your browsing sessions. In addition, advertisements might take you to websites full of malicious software. If you erase this software, it is very likely that you will reduce the possibility of encountering malicious software. Of course, not all advertisements will route you to unreliable places; however, BestDiscountApp does not check third-party links and is definitely not going to take care of your security. As can be seen, it is very risky to keep BestDiscountApp on your system, so you should rush to remove it from your PC. It may seem that BestDiscountApp is an innocent application; however, the truth is that this program might perform different undesirable activities behind your back. Yes, you have understood correctly – BestDiscountApp will not only show advertisements after the infiltration into your system. According to the specialists at 411-spyware.com, BestDiscountApp will also collect and record non-personally identifiable information. If you do not like this, you should delete this adware program as soon as possible. In order to delete BestDiscountApp, you should go to Control Panel, locate the BestDiscountApp entry, and then delete the software from the system. Our manual removal instructions (see below) will help you understand the removal process better. Even if you manage to delete this program from your system, it is still very important that you scan your PC with a trustworthy malware remover in order to delete any remaining infections. We believe that SpyHunter will be able to accomplish this task without any problems. In addition, it will prevent other serious infections from slithering onto your computer. Type in control panel in the Open field and click OK.
Find the software that you wish to remove. Quick & tested solution for BestDiscountApp removal.